French test pilot mission specialist astronaut 1985-2003. Trained for missions under both US and Russian programs. Status: Inactive; Active 1985-2003. Born: 1949-09-30. Spaceflights: 2 . Total time in space: 18.74 days. Birth Place: Vincennes. Born September 30, 1949, in Vincennes, France. Four children. Hobbies include Aeroclub, parachuting and parafoil, tennis, wind-surfing, water-skiing, snow-skiing, cross-country running, wave-surfing, microcomputers. Tognini was educated at Lycee de Cachan, Paris. Received an advanced mathematics degree in 1970 from Epa Grenoble (military school). He enrolled at Ecole de l'Air,(the French Air Force Academy), Salon de Provence, France, graduating with an engineering degree in 1973. Tognini attended the Empire Test Pilots School, Boscombe Down, United Kingdom, in 1982, and the Institut des Hautes Etudes de Defense Nationale (IHEDN) in 1993-94. French Aeronautics Medal; Chevalier de Ordre National du M�rite; Commander dans l'Ordre de la L�gion d'Honneur; Soviet Order of Friendship between the People; Russian Order of Friendship between the People. Engineer from the "Ecole de l'Air." Fighter Pilot (all levels). Test Pilot. Airline Pilot. Military Technical Diploma (BTEM). Cosmonaut Diploma from the Soviet Union. Following graduation in 1973 from the Ecole de l'Air, Tognini was posted to advanced fighter pilot training at squadron based at Normandie-Neman where he served for one year before obtaining his advanced fighter pilot training. From 1974-1981, he served as an operational fighter pilot in French Air Force (Cambrai Air Base), at the 12th Escadre de Chasse, flying SMB2 and Mirage F1 aircraft. During this tour of duty he served as flight leader in 1976, and flight commander in 1979. In 1982, he was admitted to the Empire Test Pilot School in Boscombe Down, United Kingdom, and later that year was awarded his test pilot diploma. He was awarded his military studies diploma in 1983. Tognini was then posted to the Cazaux Flight Test Center, France, initially as a test pilot and subsequently as chief test pilot. During his time there, he helped test a great deal of French flight hardware. He did the weapon systems testing for the Mirage 2000-C, Mirage 2000-N, Jaguar ATLIS, and FLIR aircraft, and was also responsible for flight safety for pilots, experimenters and flight engineers. In 1985, France opened a recruitment program to expand its astronaut corps, and Tognini was one of seven finalists selected in September 1985. In July 1986, he was one of four candidates to undergo medical examinations in Moscow. In August 1986, he was assigned as the back-up for the Soyuz TM-7 mission. 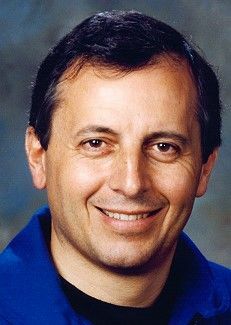 Although Tognini remained a French Air Force officer, he was placed on detachment to CNES for his space flight activities from September 1986 onwards. In November 1986 he reported to the Yuri Gagarin Cosmonaut Training Center, Star City, Russia, for alternate astronaut training, including EVA, for the Soviet-French ARAGATZ mission. During 1989-1990 he supported the HERMES program in Toulouse, France. In 1991 he returned to Star City, Russia, to start prime crew training for the 3rd Soviet-French ANTARES mission. During his stay in Russia Tognini also gained piloting experience of BURAN simulators (MIG 25, TUPOLEV 154). Tognini has 4000 flight hours on 80 types of aircraft (mainly fighter aircraft including MIG 25, TUPOLEV 154, LIGHTNING MK 3 and MK 5, METEOR, and F 104). He is fluent in English and Russian. Tognini made his first space flight on board the Soyuz TM-15, TM-14 (July 27 to August 10, 1992). Together with Anatoly Solovyev and Sergei Avdeiev he linked up with Mir 1 (ANTARES mission) and joined the crew of Alexandre Viktorenko and Alexandre Kaleri already on board. They spent 14 days carrying out a program of joint Soviet-French experiments before returning to Earth. He returned to France following the mission. During 1993-94, he attended a training cycle of the French Institute for High Studies of National Defense (IHEDN). Use of new systems for future aircraft (classified report, 70p). Boscombe Down Preview on Lightning Mk III (report, 300p). The SOYUZ spacecraft system (CNES report, 150p). Tognini attended ASCAN Training at the Johnson Space Center during 1995. He was initially assigned to the Operations Planning Branch of the Astronaut Office working technical issues on the International Space Station. Tognini served aboard Space Shuttle Columbia on STS-93 (July 22-27, 1999). During the 5-day mission his primary task was to assist in the deployment of the Chandra X-Ray Observatory, and to conduct a spacewalk if needed. The Chandra X-Ray Observatory is designed to conduct comprehensive studies of the universe, and the telescope will enable scientists to study exotic phenomena such as exploding stars, quasars, and black holes. Mission duration was 118 hours and 50 minutes. A veteran of two space flights, Tognini has logged a total of 19 days in space. Family: Astronaut. Country: France. Spacecraft: Mir. Flights: Soyuz TM-7 Aragatz, Soyuz TM-14, Soyuz TM-14 Mir 92, Soyuz TM-15 Antares, STS-93. Projects: STS. Agency: French AF. Bibliography: 12, 6118. 1949 September 30 - . Birth of Michel Ange-Charles Tognini - . Nation: France. Related Persons: Tognini. French test pilot mission specialist astronaut 1985-2003. Trained for missions under both US and Russian programs. 2 spaceflights, 18.7 days in space. Flew to orbit on Soyuz TM-15 (1992), STS-93..
1988 November 26 - . 15:49 GMT - . Launch Site: Baikonur. Launch Complex: Baikonur LC1. LV Family: R-7. Launch Vehicle: Soyuz-U2. Soyuz TM-7 - . Call Sign: Donbass (Donbass - River Don basin). Crew: Chretien, Krikalyov, Volkov, Aleksandr. Backup Crew: Serebrov, Tognini, Viktorenko. Payload: Soyuz TM s/n 57. Mass: 7,000 kg (15,400 lb). Nation: Russia. Agency: MOM. Program: Mir. Class: Manned. Type: Manned spacecraft. Flight: Soyuz TM-4, Soyuz TM-6 Mir LD-2, Soyuz TM-7, Soyuz TM-7 Aragatz. Spacecraft Bus: Soyuz. Spacecraft: Soyuz TM. Duration: 151.47 days. Decay Date: 1989-04-27 . USAF Sat Cat: 19660 . COSPAR: 1988-104A. Apogee: 235 km (146 mi). Perigee: 194 km (120 mi). Inclination: 51.60 deg. Period: 88.80 min. Mir Expedition EO-04. Carried Alexander Volkov, Sergei Krikalev, Jean-Loup Chretien to Mir; returned Volkov, Krikalev to Earth. Initial Orbit: 194 X 235 km. Thereafter maneuvered to rendezvous orbit 256 X 291 km before docking with Mir in 337 X 369 km at 17:16 GMT 28 November. 1992 July 27 - . 06:08 GMT - . Launch Site: Baikonur. Launch Complex: Baikonur LC1. LV Family: R-7. Launch Vehicle: Soyuz-U2. Soyuz TM-15 - . Call Sign: Rodnik (Spring - water spring). Crew: Avdeyev, Solovyov, Tognini. Backup Crew: Haignere, Manakov, Poleshchuk. Payload: Soyuz TM s/n 65. Mass: 7,150 kg (15,760 lb). Nation: Russia. Agency: MOM. Program: Mir. Class: Manned. Type: Manned spacecraft. Flight: Soyuz TM-14, Soyuz TM-15, Soyuz TM-15 Antares. Spacecraft Bus: Soyuz. Spacecraft: Soyuz TM. Duration: 188.90 days. Decay Date: 1993-02-01 . USAF Sat Cat: 22054 . COSPAR: 1992-046A. Apogee: 216 km (134 mi). Perigee: 196 km (121 mi). Inclination: 51.60 deg. Period: 88.60 min. Mir Expedition EO-12. Russian astronauts Solovyov and Avdeev and French astronaut Tognini were inserted into an initial 190 x 200 km orbit inclined 51.6 deg. Later on July 27 they maneuvered to a 223 x 343 km orbit, and on July 28 docked with Mir in its 405 x 410 km orbit. 1992 August 10 - . Landing of Soyuz TM-14 - . Return Crew: Kaleri, Tognini, Viktorenko. Nation: Russia. Related Persons: Kaleri, Tognini, Viktorenko. Program: Mir. Flight: Soyuz TM-14, Soyuz TM-15, Soyuz TM-15 Antares. The Soyuz TM-14 crew, Aleksandr Viktorenko and Aleksandr Kaleri, returned to Earth together with French astronaut Michel Tognini. The Soyuz TM-14 undocked from Mir at 21:47 GMT on August 9, and landed in Kazakhstan at 01:07 GMT on August 10..